There’s a first time for everything, and here at Gabfire, today is that day. We have officially released our first FREE theme. Yes, you read that right! Gabfire Themes has released their first free theme titled SnapWire, and you can get your hands on it immediately. What are you waiting for? Go download Snapwire, tweet about it, tell your friends on Facebook, forward the download link, and call home about it – it’s a big deal! We’ve been wanting to release a free WordPress theme to the community for quite some time. Many of our supporters and community members have been asking what we were working on these past few weeks, and now you know. 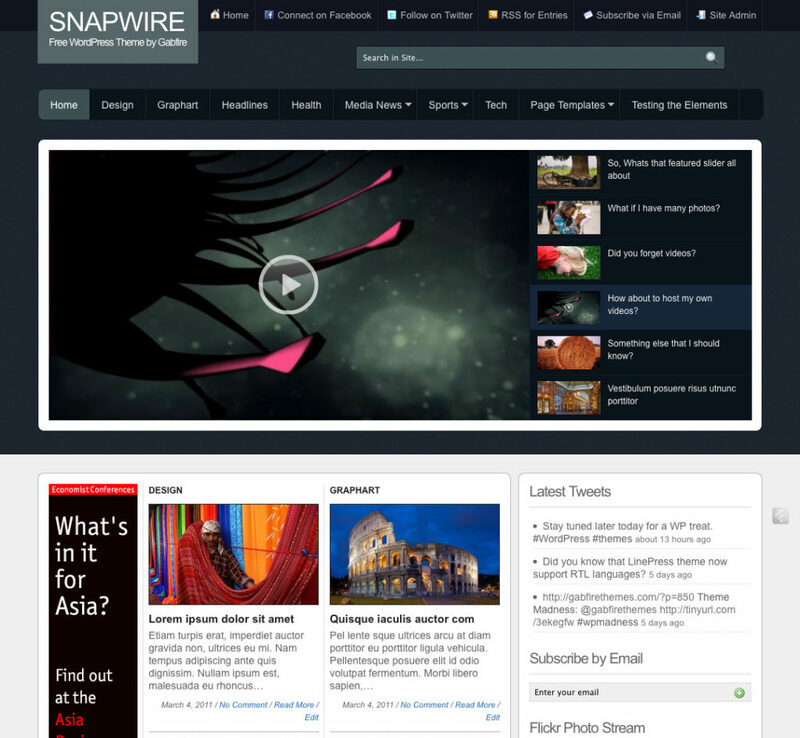 SnapWire has a sleek layout that can be used as a newspaper site, or condensed for your personal blog. With 9 separate content areas on the home page, SnapWire gives you more than enough real estate to showcase your best posts across various categories. From the theme’s control panel, you can disable sliders, enable/disable auto rotation, set number of posts and many other options. With over 25 widget areas, you’ll have the flexibility to customize SnapWire to look and feel exactly the way you want. We can go on about the page templates, category templates for media, multiple styles, and more. As always, there are dozens of theme options to modify the site to your liking. Most importantly, you can expect the same level of thought-work put into the SnapWire back-end as any of our other themes. But why not have a look for yourself. SnapWire is the first free theme by Gabfire, and we’re looking forward to hearing your feedback either here or on the support forums. Check out the SnapWire demo and tell us what you think of SnapWire or submit your site to the showcase. Snapwire is a free theme but it does not include any support. To be able sign in support forums and get help, you’ll need to purchase a theme from our theme library. Please do not ask for theme support via comments. 151 Responses to "SnapWire – Free WordPress Theme by Gabfire"
That is absolutely fantastic, beautiful design. Now every WP user can have a top news site. Really proud to be a part of the Gabfire community and that my purchases have helped give birth to something for everyone. Thanks for the kudos Eddie!!! Thanks for the great featured Free Premium Theme for WP lovers like me :-). This is one of the best WP free themes; very professional style and options. However, the download link doesn't work with Download Manager and there's no way to download the theme if DM is installed on your machine. Please fix this issue. Many thanks. Thanks for nice comments Mark. Not sure why you are not able to download it. It is a small zip. Can you try to disable your download manager and try direct download that way? Snapwire is a beautiful theme – and you haven't spared any polish just because it is free. A nice addition to the Gabfire list. Definitely want the WP community to enjoy the complete Gabfire experience 🙂 Thx for the compliment. Awesome work on this template, love the design!!! Always fun to see what is "NEW" on the horizons from Gabfire Themes. Great move and another great premium theme. Free is unbelievable! Good Job!!!!!! Hey Charlie, just noticed that the 120 X 600 media ad box on left is not available to change the ad. Thanks. Hey Mehmet Downloaded new version. 120 X 600 ad box is now there, but get this warning now where it was. "Warning: …." Put in some ad code but it did not change. Fixed, can you re-download it Tony? Same problem for me, ando also slide dont work with one category. Very complimenti GABFIRE very good theme. Love the new theme, got it installed no problem with the instructions but was wondering if there are any docs on how to add images and videos to posts? For images use WordPress' built in "Set Featured Thumbnail" option. As for videos, we will have tutorials released soon in our codex. i got the same problem did you find a solution ? Easily the best free theme I've ever seen (already in action at http://www.dogmagazine.ca) – in fact, it'd be right up there as one of the best PREMIUM themes! Fantastic and thank you. You have a great web page with this theme. I want to know how did you change the dark background of the page top. This is the only part that I don't like. Another great theme from Gabfire Themes. I wonder why this is free as it's got all the features of a paid theme but …thanks! I've got a question: how do you add a video to the post and make it show in the fetured posts slider on Front Page? Do you have some documentation for this? I think I'll sign up for a full membership as your work is great and by doing that I'll show my appreciation for it. Awesome Theme but – how do you get Category based advertising turned on? I like to see what others have done with the theme. There is a do not duplicate post option, same post won't show up twice on front page. How do you add a video to the featured sideshow on frontage? Taran, you have an account for support forums, right? Mehmet this theme is amazing! I was about to log in to support area when i saw it and the fact that you are giving it away for free only goes to confirm what i tell everyone about you. Not only are you the best WP theme designer out there, you also have the biggest heart. Thank you for giving the world the best!!! Mehmet – I know this is maybe a support question but….you state the theme has category based ads and it doesn't seem to be the case. Can you simply say where this is within the theme settings? 1-I'm using on of "WP Now" themes,which is uses custom field thumbnail for images,i love this theme,but what should i do so i could put images like before in custom field to be show in the homepage and single posts? 2-In all my old posts,i've putted images in the custom field thumbnail,now when i activated this theme,images in old posts doesn't show,what i have to do with this? Thanks for your answer,but how to put thumbnail images that are not uploaded on my site..for example "Image Shack" links.when i paste the link in custom field thumbnail,it doesn't show…i used some plugins but didn't fix my problem. Nice work with the Snapwire theme. I have one problem though. I can seem to add comments from the front end of my website. something like a comment 'div' appears but its empty. Thanks for snapwire theme.. Perfect wordpress themes.. I like theme gabfire. I want to try download it sir. Can I do? Wow! I had never heard of gabfire before today. I came across a blog I really liked, looked for the theme name at the bottom, and came to this gabfire site. My first reaction was "pretty! ", my second reaction was "pricey! ", and when I saw that there is a free theme available, my third reaction was "yay". I do work with a few woo themes, and think that Elegant Themes are really beautiful, but I am also really excited to try this one out. it seems that you can have content blocks by category, and I have searched high and low for free or inexpensive themes that can do this with built features (I think I tried this in Atahualpa with a plugin called WP Loop) but haven't really found anything yet. I think the problem is the number of post i have to writte to appear in the spaces… the page day per day work better. I must writte many post. plz.. tell anybody. how to add a video in slider? i can add video but its not show on slider. Hold the phone – we've figured it out. No need to post or read my previous response. Thank you! What was teh solution? Im having the same problem. No images showing up in the slider, even when added as a feature image. I have used WordPress themes for the past 3 years and none had come close to this (not even paid ones). Can anyone please guide me on how to change the background colour. I already changed the background image but that only affected half of the page downwards. First things first, let me thank you for creating such a fluid theme and making it free! I've not seen a more engaging theme anywhere! get videos to play in the slider. Do I need to become a client to do that? It's literally the only missing element to my blog. Am I just overlooking something? Congratullations!!!! Really good theme, beutiful design and easy to use!!! I don't know if it's just me , but I'm having probling with the thumbnails. I don't know why but it seems that they can't find the image it comes with a broke link. Well hope you guys can fixed this problem soon! Many thanks for this amazing template! many thanks gabfire for these amazing theme! Nice theme but I am getting problems to generate 404 page, the theme is not generating 404 page and there is no 404.php on the theme folder as well so I created one but still not able to generate 404 of removed posts/pages/tags etc. Thanks. Yes, it will always be free. I'm getting a blank when a bad link comes up. Not being redirected to the homepage. Anything I can do on that, while we wait for the next release! Nice theme, I would like to now hot to adjust the header image in this theme, I am having some difficulty with it..
Thx a lot Gabfire! Theme is awesome! This theme is better than some of the paid ones I've seen. I was online searching for hours upon hours for a theme that had everything I wanted – when I found this one my face dropped because I couldn't believe such a well-designed theme was absolutely free – thank you, thank you, thank you! I have a slight issue and I believe it might be with the 000webhost service I'm using. I created my own website and everything on my own so there's probably something I didn't do that's causing this. I'm just doing test posts right now to make sure everything works out before I put up the actual content of the site. The pictures in my posts are showing up fine but there are no pics on the homepage – what to do? Thanks for nice words. Check this page please. But I believe you should better change your hosting company. I like the theme and it's advanced magazine style look up.I have installed it without any trouble . Will get back to you after a few days. Love the theme. I've figured out how to change the size of the search bar but how to I make it so that it's on the right side of the page and not in the center? Mehmet Karde?im Türkiye'den san?r?m. Türk?e sormak istiyorum. Teman?n demosunda bu slayt ekran?nda video t?klamadan direk ana sayfadan ?al???yor. Ancak ben siteme bunu bir türlü uygulayamad?m. Nereden yapmal?y?m?. Slayt video i?in nereden yüklemeliyim? Hey, thanks for this theme. It is amazing! But I have one question. If I change the default header image and I upload another, the new header has not got the H1 tag. What can I do to solve this in a SEO-friendly way? Oh, at the moment, I've made a conditional in php (if is home) show the H1 tag, and this tag is hidden using CSS. But I am affraid because Google could take my blog as a black hat. What do you think? In many blogs there is the H1 tag hidden using CSS, such as Mashable or Problogger. Thanks! It took a little while to set up.. and there's sill a couple details I haven't figured out, and a couple I have, I just haven't done them yet, It was the first time I ever set up anything except basic Blogger.. I'm very happy with it, I plan on using it on two other sites. I get compliments on it all the time, The only reason I don't get on Gabfire's affiliate program is because inside of a week 10 of the other site owners I blog with would be using it too. love it, and will use it. the best template I ever used and believe me, I was checking out hundreds for my blogs. I love your template. It’s very stylish, complete and useful. The only I personally don’t like too much is that I can’t do a custom crop on the images I use as thumbnails. Is there a way I can do that? I like a lot of what I see and hear, and I’m test driving the theme right now before I make it live, but I’m having some issue I hop someone can help me with. I’m trying to help my students use this theme for our school newspaper, but creating a site is a new experience for us, and without being able to find documentation particular to this theme, we’re a little lost. I too have had problems adding videos to the feature slider — one of the elements that originally drew us to the theme. We also wanted to use some of your other page templates, but I really can’t figure out how to do that. How can I apply a template to a new page that links to the front page? In the front page main containter, can I change the sizes of the columns or of the containters? And the home page sections that link to categories — is it possible to place a widget in one of those areas? Is there printed documentation somewhere that can help us troubleshoot … or is there a way for your clients using this free download to also join the gabfire support forum? This is absolutely a wonderful theme. I am having a little problem which is as under. 1. Posts are not aligned in Top Content section. Image size is the same but excert size is different and it disturbs the alignment. 2. Certian posts does not get summary and thumbnail when shared on facebook and networks while some others do really fine. Can could be the problem? I have tried disabling all plugins and reinstalling the theme twice but no dice. Never mind…Yeah! I reinstalled 3.3.1 wordpress and your theme and made sure all plugins were disabled/deleted, started from sratch and it works like a charm. I’ll definitely sing your praises! Great job GabFire! Going to tinker around with it now. Fab job! Ok, you can ignore the 1st two comments. I’m having problems with the thumbnails like the others above. This is in reference to the images for the slider. I don’t see an easy want to find the path listed for the images. The link above that someone else gave to mitigate the issue is not working. Any advice is much appreciated. I love the theme design. However, if you look at my page and scroll down, you will see several “uncategorized” boxes. Behind the scenes, there are four sets of each. I cannot delete any of them. How can I remove the duplicates? Ok I know this sounds like a ridiculous question, but I cannot for the life of me figure out how to get the media bar working. Other than that, my students and I love this new theme for our school newspaper website. Can you tell me where I can find a tutorial concerning the media bar? What exactly is your issue with mediabar Coni? It display entries but does not slide? On theme control panel -> under the categories tab make sure to select a category for Media slider – Front page section. You also need to set a number of entries for media bar on same page. Got it! Thanks! Now look at my next problem below. It’s got me stumped. I like the structure of this comment.. can i copy it’s css? or do you have a theme that uses the same comments.php code? Also i’d like to suggest an alternate position of the avatar per comment. like first comment, avatar shows on the left side, next comment avatar shows on the right. You need WordPress in order to use thia theme. And precondition of WordPress is to have PHP5 installed on your server. Thanks Mehmet. Changing my server php. Congratulations for you great themes. I love this theme! But I’ve submitted questions before and not received any answers. I’m hoping this time someone can help me because I really have exhausted everything I know to do. Yesterday I added several things to the site, and somewhere along the way, all of the fonts changed to a bold italic style. Some fonts even changed from red to gold, and some changed font size. It’s driving me crazy. I’ve tried several different approaches but cannot seem to fix the problem. I’m surprised at how fast that took my website from looking extremely neat and aligned to downright messy. The font seems to be inherited from somewhere, but I’m not sure what that means, either. Before this, my fonts were the same as the demo site. Can you help me make this change? PROBLEM SOLVED! The changes in fonts must have stemmed from a specific video we had uploaded. Things are beginning to look up. I still have a few font issues, but nothing like before. Once again, this theme rocks! How do I change the fonts on the main navigation bar? And what font does you demo site use in the body? It’s so clean and streamlined. Another question — How can I place a white border around the thumbnails in my featured slideshow? Things are a little dark in that area for me and I think that might help. AND — how do I get rid of the FOOTER1, FOOTER2, FOOTER3 labels in the footer area? Love your theme, but having the same problem as Angel had with saving Theme options. How can this be done? Your theme si lovely, but being not able to edit the options makes it rather useless to me. Dear Igor, as we wrote above on this thread, we do not have official support for SnapWire and we do not provide support via comments. The only place where do we provide support is our support forums which is dedicated to our premium members only. One more — One of the problems that has remained since I got the fonts issue corrected is an alignment issue in the sidebar 1 container. I have social media buttons there, and they moved from appearing horizontally to lining up vertically. Anyone else having issue with this theme loading slow? Thank you for your themes. I See this theme use timthumb 2.8.3 version ¿has this version any vulnerity problem? ¿have i to change anything in code? thanks again. Just add widgets into footer zones. Go to admin -> widgets -> and move widgets into Footer1, Footer2 and Footer3 zones. Thank you. I did it but I still have the blocks where it’s written FOOTER1, FOOTER2, FOOTER3 bellow of my 3 widgets. merhabalar. Arama sayfalarında genel bir hata farkettim. http://demos.gabfirethemes.com/snapwire?s=arama&x=0&y=0 mesela bu arama yapıldığında sidebar altta çıkıyor. Ayrıca bcrumb iki tane oluyor. teşekkürler. I had 0.7 version of Snapwire Theme and it was not generating thumbnail using Timthumb option and I upgraded to the latest 0.9 version, hoping for the fix this time but it is also not generating thumbnail using Timthumb. Haven’t you tested Timthumb before releasing theme? Hello, first or all, this theme is AWESOME. The only problem I have is that the innerpage slider doesn’t work! I did activate it and it was working fine then suddently it stopped working and now all I see is the manual navegation and the arrows, do you know what’s happening?? I can’t read any of the threads on the support forum. I got an account but everytime I want to login it says my info is wrong (and I’m sure it isn’t) or that I have not privileged access. Do I have to pay? Hi Sandra – The support forums are only for premium theme owners. You could purchase support access. As for the site issue, it wouldn’t happen all of a sudden. It’s likely that a plugin (turn them all off to check) or added code is causing the issue. Does anyone have an answer to the question how Videos can be added directly to the slider? great theme design, specially for games blog I think. Mehmet hocam bugün durduk yerde timthumb sorunu cıktı sitemde. Could not create the index.html file – to fix this create an empty file named index.html file in the cache directory. Sanırım index.html dosyası oluşturamıyor cache dosyasında.. Tüm izinler bormal timthump.php dosyasıda güncel..
Nasıl çözeriz? yardımcı olursanız sevinirim.. This theme really offers all the functions I was looking for – except for one thing: I miss Pinterest in the Social Media widget. When will you include it? Any chance for an update? We may add it with next framework update. after completing one cycle it’s showing some code sometimes?? Can you give me the size of sliders for the images?? Hello. Thanks for the great theme. It has been working well, but I recently noticed a blank space at the top of the theme. I’m using the default.css on http://www.intellectualgiants.com. Is there a way to fix it? @sharon – If it wasn’t there before, then it’s most likely caused by a plugin. Deactivate all of them to test. If you’re a premium theme owner, feel free to post this on forums as well and we can have someone dig into it if that doesn’t work. Just checked with Chrome and slider seems to be working fine on our end. Can you please see if you can reproduce the same issue on theme’s live demo page? I’m also having problems with the slider in Chrome. Actually, even the demo’s slider doesn’t want to work in Chrome. The smaller posts and photos to the right of the featured photo don’t show up at all in Chrome. I’ve tried from several computers for several days now. Suggestions? Great theme! i could use it in my airline tickets site! First – Thanks for sharing this great theme for free! I do respect not bringing support issues to the blog, but testing Snapwire I have two questions – which surely is meant to be covered in the documentation. 1. I seem unable to create photo (multimedia) galleries, I guess the process is obvious (I have added relevant cat. ID to the Media Category Template) but still…can you adwise? 2. The Mainpage media gallery slider does autorotate, but when it gets to the end, it stops, not starting over again (like the Featured Slider). Is there a setting to get it to (auto)continue? I am soon going commercial with a site and will then be glad to sign up for at least one theme&support. I think your themes stands out from the crowd. Great work! 1- Can you give us your site url and the ID no of category that you entered into theme control panel? Oops…Re. my comment above – adding a new page, there is no “Media” page template avail. in the dropdown template list. Mehmet – thanks for responding. with the previous, but it does not seem to work. Re. 1. I noticed there is no “media” page template (file), so I guess its not possible to show photo (/video) gallery without using that page template. Sorry for not reading the documentation thorough enough in the first place – will you be adding that template? How can I download it ? There isn’t a link anymore. And is there anyone to explain how to use menus primary- masthead ? I coulnt use them and theme is automatically put my cateogies on the menu. The link is fixed, please try again Aykut. As for links you need to use custom menus. I have a problem with the footer on the home page. It doesn’t appear normaly, but it is ok on the posts. Have you got an idea? Hello, just to say I solved my problem: my sidebar was too long, so the footer has problem. Now it’s OK and I like you theme! Thanks for all! You’re great! Hello, I want to ask about Video gallery. How I can to create Video gallery on the theme like this? Hi, it is really a great theme for free. At http://www.e-airtickets.gr we moving towards a complete website redesign and this theme is definitely gonna be one of our choices. Thumbs up and keep up the good work! does any one know how to fix menu. I am not able to fix the menu. I want to know if it is normal that it have no link for previous and next post at the footer of the posts? It will be usefull! Thanks for your answer! How to put links on the images of ”Media Category Template” to open links of the category instead opening big image of the category? I updated theme version. Solved. Thank you! After updating theme version, custom fields are lost. How can I solve this? Hi again. Sorry for bothering you. I solve the problem of displaying custom fields. Ignore previous comments, and sorry again for these questions, but i was a little desperate of massive changes. Thanks for finally writing about > SnapWire – Free WordPress Theme by Gabfire < Loved it! When I press the download button, it redirects me to the blog page. How can it can be downloaded? Just want to add my thanks for this great theme. It’s been doing really well for one of our clients for a few years. But recently whenever an author saves a post as pending review it shows on the front page.